Aby Ndiaye lives in Badar Gueye, Senegal together with her five children and husband, and is an active member of The Hunger Project’s Diokoul Epicentre. After completing middle school, she attended literacy classes for two more years before becoming the main point of contact for all monitoring and evaluation activities in the village committee. Today, she is a champion of her community’s development. Her strength and perseverance have seen her take on many leadership roles, including becoming the Vice President of the Diokoul Epicentre Committee during the Epicentre restructuring process in 2013. 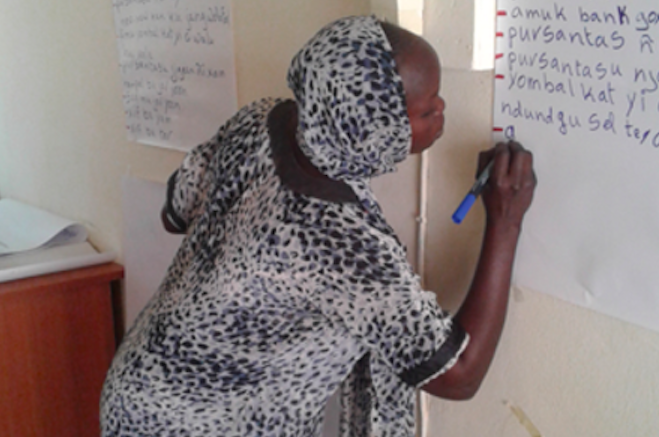 As a community leader, Aby pioneered principles of microfinance in her Epicentre. By adopting a “savings before credit” approach, in just one year, Aby was able to raise more than 200,000 CFRA Francs to begin a special savings fund for her village. The fund is a village savings and credit account that supports 42 village women, offering loans for anywhere between 10,000 and 20,000 CFA Francs per person. These loans are used to grow the community’s income-generating activities, such as embroidery and petty trading.